New Listing – 2 bedroom, 2 bathroom ground floor apartment overlooking the community grounds. The communal pool for this property will give you all day sunshine and has plenty of room for everyone to enjoy their own space. The property has everything you need to enjoy your stay, the property is equipped with air conditioning in both bedrooms and 2 ceiling fans in the lounge to keep you cool in the warmer months, you can also use the air conditioning units in the bedrooms to warm you up when the weather is not quite so good, or cool you down in the warmer months. You will find and a fridge/freezer, microwave, English TV, Wi-Fi, a washing machine, iron & ironing board, hairdryer and beach towels to ensure you have everything to enjoy your holiday. 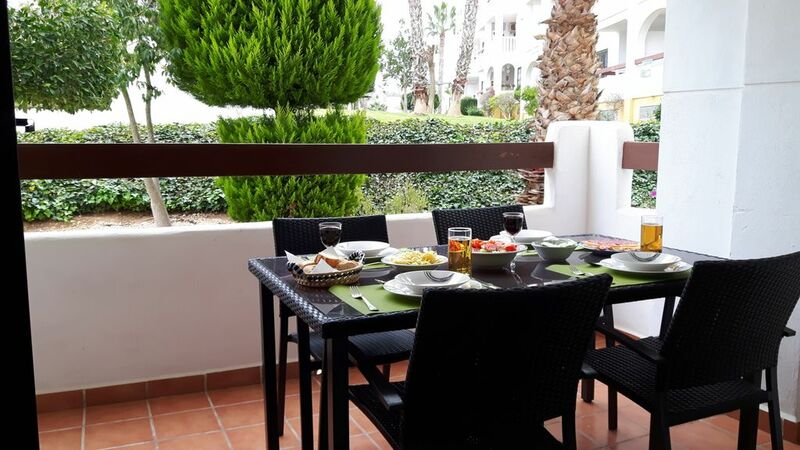 The property is only a 2 minute walk to Villamartin Plaza giving you approximately 30 restaurants and bars as well as a supermarket, pharmacist, medical center and dentist should you need it. On the doorstep you will also find 2 local bars and an Italian restaurant if the Plaza is too far for you to walk, this area is a sun trap during the winter months during the afternoon. Next door you will find Villamartin Golf Club with another 5 golf courses within a 15 minute drive. Other properties available to rent that share the same pool as this apartment, send an enquiry for more details. Zenia Boulevard is a short drive away where you will find an array of retail shops as well a floor dedicated to restaurants which are open late into the night. You will find smaller tapas and coffee bars scattered within the retail shops should you need a rest. There is plenty of free parking and a children’s play area should you need it. There are plenty of local beaches from La Zenia, Cabo Roig, Campoamor, Playa Flamenca to name a few, they all have the necessary facilities. No problems at all with this well maintained apartment. Unfortunately the weather didn’t play ball. Thank you so much for giving us a 5 star review, we are so glad you enjoyed our apartment and hope to see you again in the future, we will try our best to arrange good weather for you next time. Thank you so much for taking the time to write a review, we are so pleased you enjoyed your stay and look forward to seeing at a Gleam Team Rentals Property in the future. Perfect for the needs of our group in a great location!! Thank you for taking the time to write a review, we are so glad you enjoyed your stay and the property had everything you needed. We hope to see you again in the future. Thank you for taking the time to write a review on our property, we are so glad you enjoyed your stay and hope to see you at one of our properties again in the future. Nous avons séjourné pour la seconde fois dans la villa de Patrick et nous sommes très contents de notre séjour. Patrick est disponible et accessible à tout moment.Il s'est préoccupé du bon déroulement de notre séjour dans sa villa et nous a bien conseillé sur les activités proches du quartier. La villa est équipée pour se sentir comme a la maison. Thank you so much for taking the time to write a review on our property, we are so glad you enjoyed your stay. We look forward to seeing you again in the future. We had a lovely stay in this villa. It was clean, modern and had everything we needed. The roof terrace with its table and chairs and hammocks was an added bonus and the pool was lovely to cool down in. The owner was extremely helpful and answered any queries we had straight away. I would advise hiring a car if you stay here and want to go to the beach etc. although we managed fine with buses and taxi's- i think it was about 8 euros for a taxi to the nearest beach. The Plaza is only a ten minute walk with its many restaurants, evening entertainment and also a supermarket. We would definitely recommend this villa. Thank you so much for taking the time to write a review on our property, we are so glad you enjoyed your stay. I think you are right about the car and we do recommend it in our advert. We hope to see you back again in the future.